On Friday (9/16) the Bazaar hosts a great low key evening not to be missed! This show will feature Deedraye of the Sad Cobras playing a few selections of her own as well as some oldies. 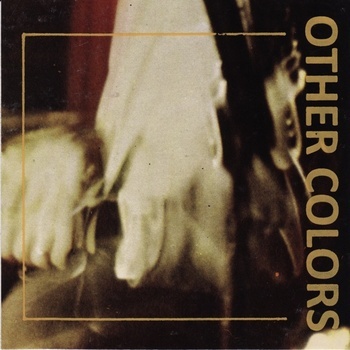 This intimately awesome evening will include Baltimore folk rock group Other Colors gracing the Bazaar with a set of tunes. Be sure to make it out to this show! Starting at 9pm and only costing $5. 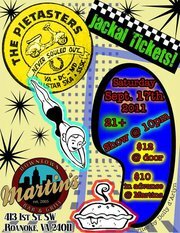 On Saturday (9/17) Martin’s Downtown Bar & Grill will host punk-ska greats the Pietasters. Opening for the group will be the only remaining Roanoke punk-ska band, Jackal Tickets. This is a 21 and up show only! Tickets are $12 at the door and $10 in advance. Showtime is 10pm. On Sunday (9/18) Kirk Avenue Music Hall hosts an all Roanoke show! The Circus Practice is set to headline with their own blend of instrumental surf rock. Lance Smith will also be performing with his group, Sinking Creek. Make sure to get there on time and witness the comic delight of the immortal Illbotz! Tickets are only $5, almost unheard of for the venue! Starting at 8pm, come out and support! P.S. 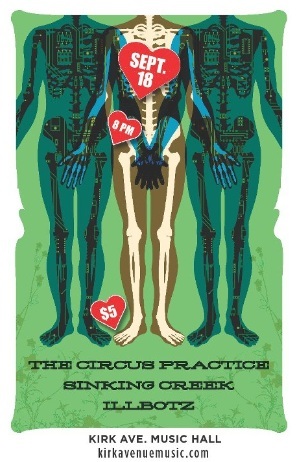 also check out the Circus Practice at Dogtown Pizza in Floyd on Friday night! We hope to see all of you here next week when we will be unveiling our newest music review and giving you a glimpse of what’s happening in the area!